"If you dream of the sun, dream of Altinkum..."
Turkish properties for sale. Altinkum, Didim, Akbuk, Mavisehir, Turkey. 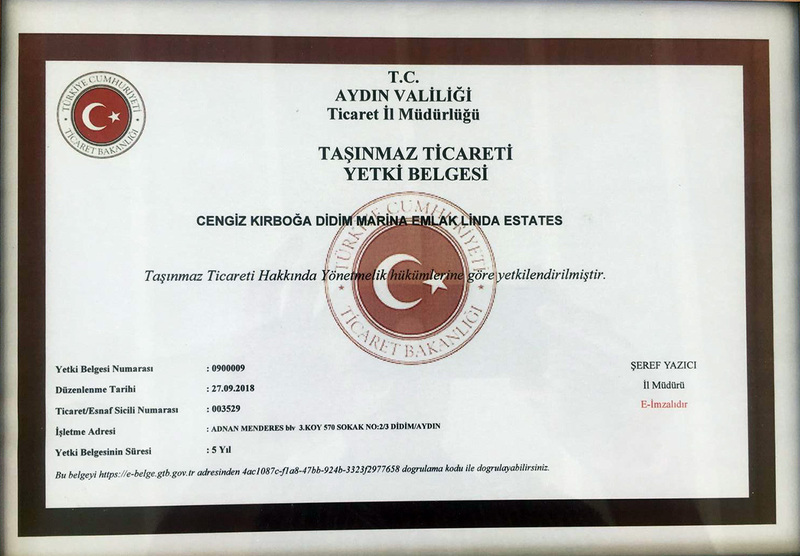 We at Didim Marina Emlak - Linda Estates, are Altinkum based real estate agents who sell Turkish properties, apartments, villas, bungalows and land plots, in Altinkum, Didim, Akbuk, Mavisehir and Green Hill. Our office is on the Marina Road, opposite the third beach. Our names are Linda and Cengiz KIRBOGA, and we met in Altinkum in the late 1980’s. When I first came to Turkey, I felt a pull to return, and after meeting my husband, we visited every year to see his family, subsequently with our children, and we finally decided to relocate in Altinkum permanently. Altinkum has changed greatly over the last 25 years, from a quiet town to a busy resort with good facilities; not only plenty of bars, restaurants, and shops, but hospitals, dentists and supermarkets serving your every need. However if you prefer a more laid back pace (partly due to the glorious sunshine from April to November) and enjoy the hospitality of local people that treat you like part of their family, then you will enjoy all that Altinkum has to offer. If, like me, when you return back to the UK, you feel sad at what you are leaving behind, why not buy yourselves a little piece of Turkey that guarantees that you will return frequently to your new home in the sun. There are approximately 78,000 registered property/land owners in Didim, some of whom who live here permanently, whilst the majority have holiday homes to enjoy at their leisure. We have many types of properties/ land for you to browse through, ranging from apartments to detached villas with swimming pools, either in the heart of Altinkum where there is plenty of activity, day and night, or further out on the outskirts of Altinkum where you can collect your thoughts whilst sitting on your terrace with an ice cold beer. I made my choice - now it's your turn!!!! Here at Didim Marina Emlak - Linda Estates, we can help to make that decision. Address: Camlik Mah, Adnan Menderes Bul. (3 Koy), 10/A, Didim, Aydin, Turkey..